Puppets, Hawaiian implements and a quilted backdrop used in the Honolulu Theatre for Youth play "Tales of Old Hawaii" were stolen Friday from a car trunk in Manoa. Actor Cynthia See is shown with some of the items. Puppets, Hawaiian implements and a quilted backdrop used in a play for preschoolers at the Honolulu Theatre for Youth were stolen from the trunk of a car in Manoa late Friday, theater officials said. But the show went on yesterday with the actor using her hands instead of props to tell the story, "Tales of Old Hawaii," to more than 40 toddlers at the Tenney Theater on Beretania Street. Louise King Lanzilotti, Honolulu Theatre for Youth's managing director, said the stolen backdrop and puppets were handmade and took weeks to construct. At least four Hawaiian implements, including gourds, also were taken. The items were in two large suitcases and secured in the trunk of a car that was parked in Manoa, Lanzilotti said. Theater personnel did not realize the items had been stolen until yesterday morning, when they started to prepare for the show. A 9:30 a.m. show was canceled, but the 11:30 a.m. production was performed without any props or puppets. Lanzilotti said the car that held the props was a rental. It is unclear when the items were stolen on Friday. A police report was filed, she said. 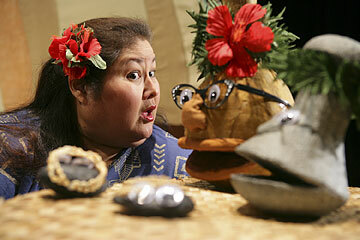 "Tales of Old Hawaii" tells the story of a young girl, Kalei, who discovers the importance of her native Hawaiian culture through different traditional implements. It started showing statewide this month and is set to continue through June. "It's a wonderful story," Lanzilotti said. "Kids and families love it." Lanzilotti said the play will continue its scheduled performances at Tenney, along with libraries and schools, but may not be able to make new puppets and props before next season. She also said she would not pursue charges if the items are returned. Anyone with information is asked to call the theater at 839-9885. The props also can be dropped off at Tenney.